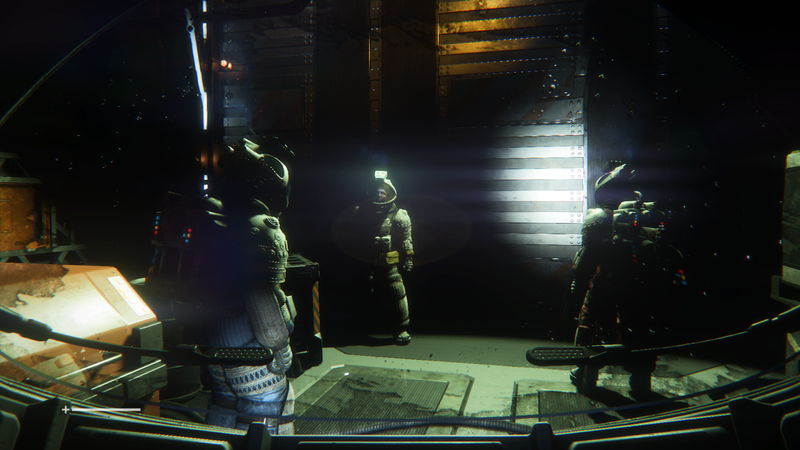 ResidentDante: In space, no one can hear you playing videogames. In space, no one can hear you playing videogames. I don't think I've been so scared playing a video game before. 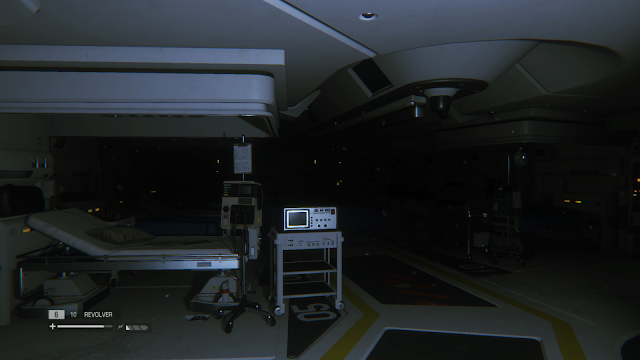 My playthrough of Alien: Isolation has literally killed me! My nerves at least. I'd have to go back in time to Silent Hill on the PS1 to relive these kind of tense and scared moments, and even that classic comes short to the way Alien: Isolation grips your inner fear and keeps holding on to it. Never have I felt so lonely, scared and with a pure sense of fear playing a game before. Being a huge fan of the movie, this is like a playable version of Ridley Scott's classic sci-fi horror. A movie-based game that actually works and lets you live the fear the characters in the horror flick must have gone through. 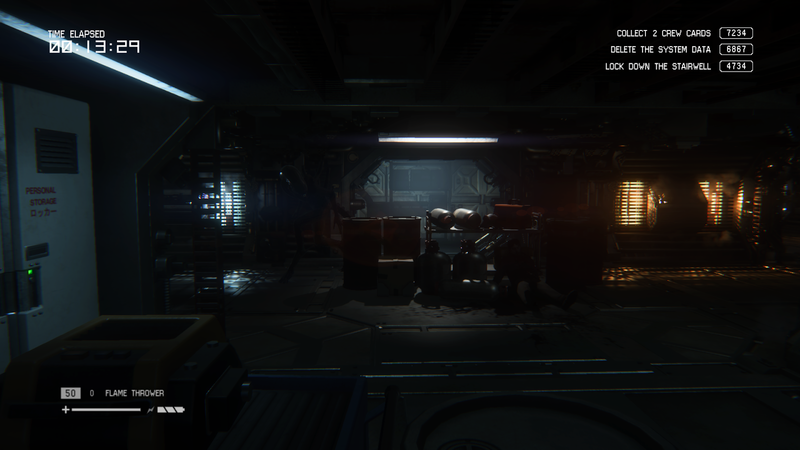 Alien: Isolation takes part in the timeline after the first movie and shows Ripley's daughter looking for the flight recorder of her mother's Nostromo spaceship. Right from the get-go the heavy influence of the movie is very apparent. Everything is designed like the late 70's movie. All the rooms, walls and objects around you look like the film set. There's even a sort of TV filter going on with the picture that makes it visually look like a movie from this era. The developers have really outdone themselves in recreating the feeling of being there. Stranded on a huge space station, you must complete various tasks to escape. All while an Alien is roaming the corridors. Unlike other franchised Alien games you have no weapons against the space creature. This gives a far more direct feeling of hopelessness against defeating the alien. In fact, this sense of sheer overpower the alien has, is what makes the game really clever and stand out from the genre on it's own. 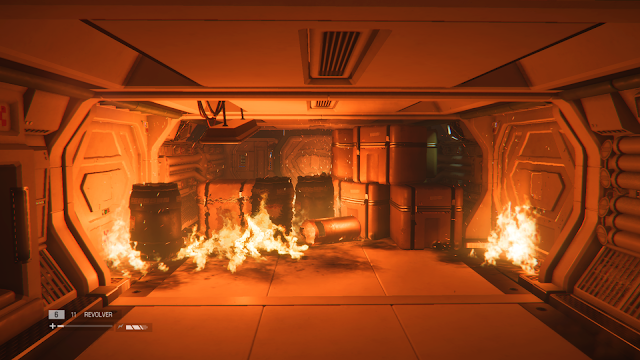 You crawl through dark airducts, traverse corridors with flashing lights, witness exploding parts of the space station, and come so close to the alien at times you can hear it breath. It's a unique, and in regards of pure fear, unrivalled feeling in the gaming genre. I would say it surpasses even the movies, because you actually feel like you are there. I played the game in a dark room, with headphones, and I actually loved the Kinect feature as it gave you a slight VR feeling: I can hold a button, then lean sideways or upwards to actually peek around corners or boxes I hid behind. Doing this really immerses you into the game world and it's one of those games you can completely spoil the whole point of it if you are playing it in a well-lit room, with low sound and people buzzing by. It needs to be played in the right way to grasp the whole horror aspect, otherwise you are actually spoiling the game. Later a friend join me to play the game, here the Kinect feature was difficult to use as we were passing the controller back and forth, but it was still as scary a game as ever without it! There are some issues I have with this title. 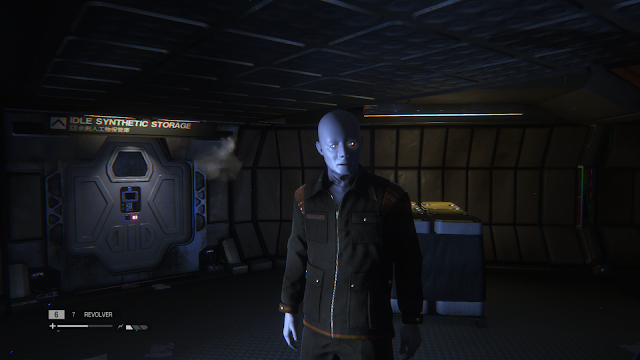 I found the way the Alien found me to be a bit on the ridiculous side at times, clearly the AI knows where you are. It makes hiding a trial and error at times. I found myself hidden in a locker, thinking it was a great way to hide, but the Alien seemed to find me there . Later, while hiding underneath a table, a place I would be clearly visible, was completely safe. It looks kind of stupid sitting under a table with a huge, obvious space under it, and the alien just strolling past looking more like a idiot than a frightening bloodthirsty creature. Luckily this happened seldom and I get that the developers need to keep the alien near you at all times to keep the tension high. While I'm probably quite bad at this game, I never really used much of the items I could craft in the game. I would have liked them to be more efficient and easier to use without being detected. The user interface is clumsy, it may be deliberate, but stuff like this always annoys me in the long run of a game. Technically the graphics sadly suffers from a lot of framedrops when the screen gets crowded with effects. It's not a fast paced game so it doesn't matter much, but it's very obvious when you need to move fast or aim a gun. The 1080p resolution seems to be a struggle to maintain even 30 fps. The length of the game is also questionable, it perhaps surpasses it's welcome at times. I would prefer a scary as hell game like this to last a bit shorter to keep the tension high. I must add though, that I appreciate the more calmer moments, it made me relax and lower my shoulders. Some of these moments dragged on a bit though. Especially a fairly large part of the game where the alien was not present, felt a little tedious. Luckily they added a few twists and new dangers so it wasn't a bad part, it just felt a little stale. Apart from the smaller issues I've mentioned; I really loved this game. It may not be for everyone, and just like the first movie, it'd slow-paced and clearly not for the inpatient. At times I was so scared I simply had to pause the game and leave the dark gaming room I played it in, to catch some fresh air. There's just something about being constantly hunted that gets under your skin! A feeling you need to let the game sink into you. If you don't let the game do this, simply playing the game in broad daylight and want action, well then this game isn't for you at all and you will spoil it's experience. So Alien Isolation is about making an effort in playing the game the right way and doing so it will reward you with one of the creepiest and scariest gameplay experiences ever. It's that feeling of being on the alert and being hunted, watched and kept at your toes. You won't find many similar, intense and unique games. You can wait a long time to find a game world so beautifully and detailed crafted to replicate a classic movie again. While it isn't imperfect, there really isn't a game like it. Warmly recommended for horror and Alien fans alike! A unique experience that focuses on being the hunted and surviving a nightmare. So scary it's hard to play it without missing heartbeats. The design, atmosphere and graphics are top notch and replicates the movie in great detail. Framedrops happen quite a bit, and sluggish controls. Can be frustrating with a lot of retries to get past certain areas. Outstays it's lifespan somewhat in parts of the game. Double speed velocity through blind forests.